So, I know not many people really liked the official trailer for Jackboots on Whitehall, the wacky puppet alternate-history WWII movie, but I think this poster is pretty damn cool and I wanted to feature it anyway (why the heck not?). Empire has debuted the official UK quad poster for the McHenry Brothers' Jackboots on Whitehall which features a cigar-chompin' Churchill (voiced by Timothy Spall) with a rifle. It has a kind of old school propaganda feeling (take that you Nazi scum! ), mixed with funky puppets, and I really like the design. Although I'm still hesitant about the film itself, it's a very good poster, so check it out full-size below. 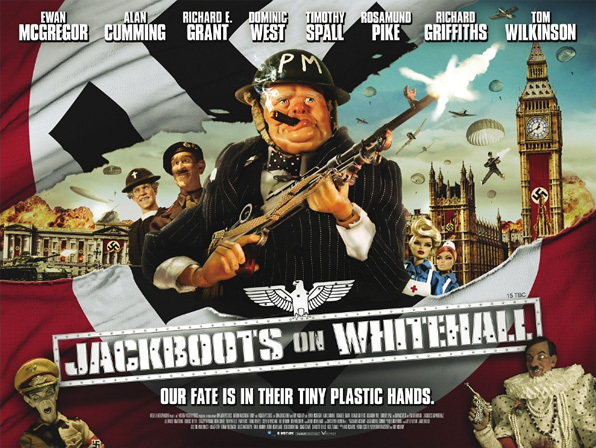 Jackboots on Whitehall was both co-written and co-directed by British brothers and first-time filmmakers Edward McHenry and Rory McHenry. The film was produced in the UK by E-Motion Pictures and Media 8, but is an independent production so it doesn't actually have a US distributor yet. It hasn't played at any film festivals yet either, so we have no clue when it'll be hitting theaters. A sales sheet from AFM mentioned that "Jackboots on Whitehall boasts pioneering techniques in animation," but beyond using puppets, we're not sure what that means. Stay tuned for any updates on Jackboots on Whitehall, only if you want. Thoughts? Still hesitant about the film itself? When the trailer was posted you said it "looks totally awesome." uhh.... hmmm...... Did everyone's negative response make you change your mind? But yeah. Movie still looks stupid. Is it just me or is this done so much better in Team America World Police? Better call the WAAAAAAAAAAAAAAAMBULANCE for 1 and 2 up there. This movie is going to be badass. Keep up the overage, ALex my man! Is that whats his face from the 2002 movie Pinochio on the bottom right? Thats the creepiest part of this whole poster!! I fail to see how anyone thinks this can be so awesome.... besides the cast, the movie looks like absolute crap. It literally looks like a 10 year old put this together. I disagree! I guess we will all have to wait and see.